Pour ½ cup of pasta sauce in a large baking dish. Sprinkle salt and pepper over chicken and add to the dish. 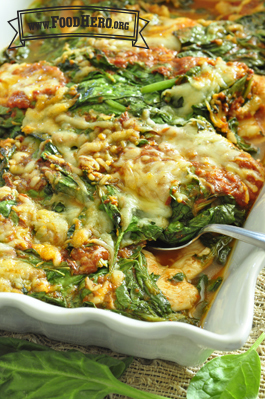 Top with remaining ½ cup of pasta sauce, spinach and mozzarella. Bake for 30 to 40 minutes until chicken is no longer pink inside and cheese begins to turn brown. 1 Comments for "Spinach & Chicken Italian"
This is tasty and delicious. It was very easy to put together and can be made with ground turkey or chicken, too. Its flavors are mild, but you can bump it up with a ¼ cup of parmesan!